BRRRRRR! It is cold out here in SouthWestern Montana, it is in the negatives and being aware of frostbite prevention and treatment is key. 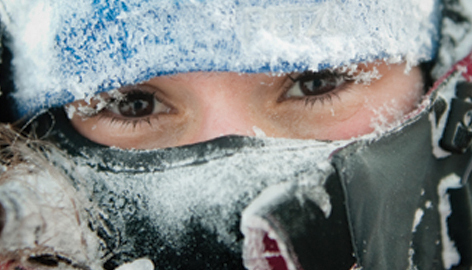 If you are hitting the slopes or ice fishing make sure you have as little as bare skin exposed to the cold as possible. Staying indoors in this type of weather is stressed, it is even too cold for most of the ski lifts up at Big Sky Resort to run today! Now if that doesn’t say stay inside, I am not sure what does! Avoid going outside recently after a bath or shower. Dress in warm layers allowing little bare skin to be exposed to the cold. Base layers should keep moisture away from skin, thermals and cotton are good for this. If you have children, consistently bring them back inside to check for any signs of frostbite. Always take extra layers no matter what. Stay dry, if you get wet it will increase your heat loss as well as your chance of frostbite. If severe frostbite is present, get immediate medical attention. Drink something warm and stay hydrated. Soak frostbitten area in warm water until it becomes pink. After skin has turned pink dry off the area and wrap in gauze bandages. Get it checked out at the hospital as soon as you are able to make it there for a thorough inspection. Avoid going back out in the cold and do not expose the affected area. DO NOT rub the affected area or bump it off of anything. DO NOT pop any blisters or break any of the affected area open because it can cause infection.